The FIVB announced the 2018-19 beach calendar last week, including the Beach Majors Series stops. 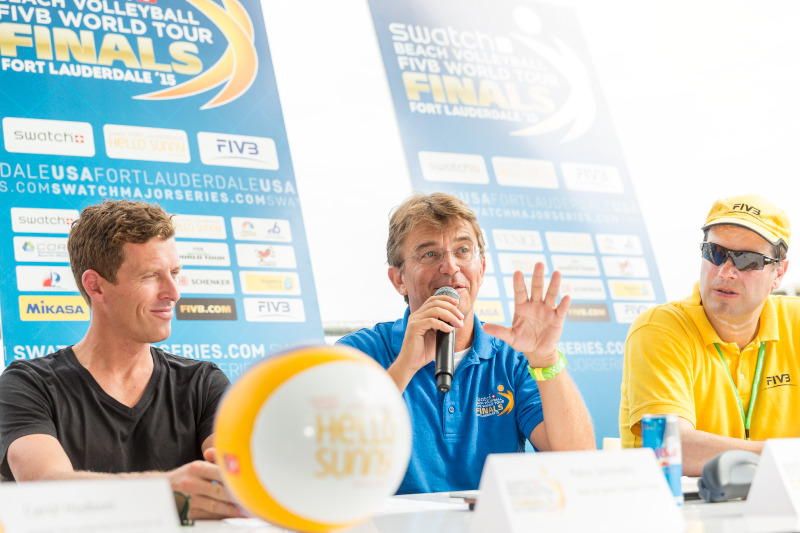 The Beach Majors will return to Fort Lauderdale, Florida; Vienna, Austria; and Gstaad, Switzerland in 2019 and also add in the World Tour Championships in Hamburg, Germany. That we host the World Championships in Hamburg. Can you talk about the continued success of the Beach Major Series in line with the push for more elite level FIVB events? It is very important to create awareness on a national level within the market for beach volleyball as a sports entity. In order to attract further media exposure and increase the partnership opportunities as well as fan engagements, our approach is to create an event on the highest quality level. As we can see in the Major Series in the increase in visitors, media deals and partnerships, we know that this concept is working. We believe this is the way to go to elevate beach volleyball to another level and making it more relevant between other major sports. How do you see Beach Majors fitting into the Olympic qualifying stage? Our 5 star “Major” tournaments have the highest ranking points for the athletes in the FIVB World Tour, which means for the athletes that our tournaments are the most valuable for them to qualify for the Olympics. Furthermore, we are conducting in 2019 the World Championships in Hamburg, Germany inside the Tennis stadium “am Rothenbaum” with a capacity for 13,000 fans, which is bigger than the Copacabana beach volleyball arena at the Rio Olympics 2016. With the World Championships the athletes experience a similar atmosphere in front of a large crowd as at the Olympics, which for them is a good preparation in regards to the pressure they would experience in Tokyo 2020. The winners at the World Championships are automatically qualified. What will continue to set Beach Majors apart from other elite event series like AVP, p1440 and King of the Court, among others? The Beach Major Series includes the best athletes and the highest ranking points on the World Tour so for athletes and fans its really already a highlight in a sport aspect, to come to our events. Our concept is to underline those sport highlights with a strong focus on entertainment and lifestyle. Within this new kind of sport entertainment, it is very important for us to create an atmosphere for the fans and the athletes that they can directly interact with each other. I am always saying that this combination is our unique “Goosebumps atmosphere”. What further sets us apart from other elite event series is our high-end Beach Majors Club in which we offer the highest quality setting with the best catering in the world (DO & CO). It’s really the finesse of those combinations that separates us in the end. Will history and the prominent ties to FIVB be what keeps Beach Majors at the top? As mentioned already, I believe it’s the premium quality which bring us new partnerships and fans that is simply making us relevant in the markets. We are working hard throughout the season to keep the beach volleyball hype up through special contents such as our Vienna “Serve the Sky” shooting which generated a huge buzz for beach volleyball and the Major Series. We believe the FIVB is also benefitting from our push in those markets, as this exposure is creating new opportunities among all the other beach volleyball properties in the world. This is what we are trying to achieve. Any thoughts of adding a major as part of the snow volleyball season? We are concentrating on beach volleyball and trying to further elevate it. For us, its one step at a time. Right now we don’t have any ambition to take action in the world of snow volleyball – we are happy on a warm beach!